April 12, 2016. Bangalore. 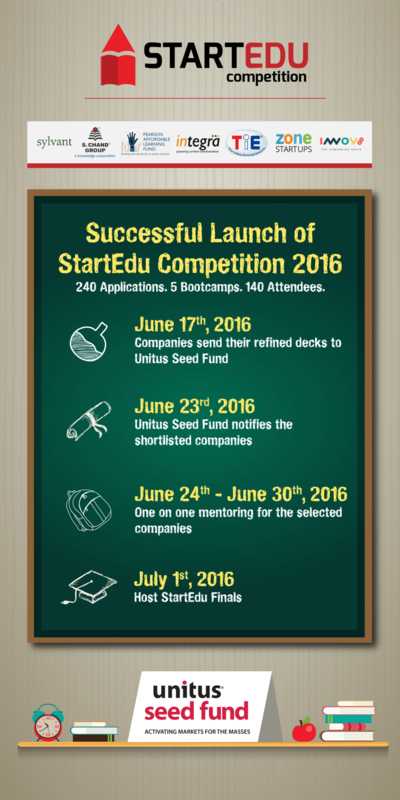 Unitus Ventures (formerly Unitus Seed Fund) and Sylvant announced the fourth edition of StartEdu program to identify the most innovative and scalable education companies enabled by technology. In the last three editions, over 250 companies applied for StartEdu. In this edition, applicants will get access to bootcamp sessions and mentoring while the winners can pitch for investments of upto INR 3 crores. According to a recent estimate from IBEF, the education market in India is worth $100 billion. India is expected to have the world’s largest tertiary-age population and second largest graduate talent pipeline globally by the end of 2020. The last decade has also seen a surge in edupreneurs who are leveraging the growth in digital technology to address the challenges of availability, accessibility & affordability of quality education thereby transforming fundamental building blocks of the sector. For this edition of the program, TiE has been roped in as an outreach partner. The selected applicants will go through an intense bootcamp across multiple TiE chapters in various cities aimed at guiding the companies on their business and financial plans. 20 shortlisted companies will also get access to expert industry mentors from organizations such as S. Chand Publishers, Pearson Affordable Learning Fund (PALF), and Integra to finetune their growth strategies. “Sylvant has incubated and advised education companies including LodeStar, Guru-G, Littlemore Innovation Labs. We are delighted to partner with Unitus Ventures (formerly Unitus Seed Fund) in mentoring and scaling up education firms,” said Anand Sudarshan, Founder & Director at Sylvant Advisors.